I recently purchased the new Tarte Amazonian Clay foundation in a duo set that also included their new Airbrush Finish foundation brush, and as soon as I opened the package and saw the brush, I knew is was the same as another brush I own, the IT Cosmetics Heavenly Luxe powder brush. After comparing them side-by-side, I can see that there are a few very subtle differences, but they're basically the exact same brush, only with different handles. Both brushes feel identical. The bristles on each are very soft and fluffy but fairly dense. Less dense than a MAC 182; more dense than a MAC 187. Both handles measure 3cm in diameter. Domed shape of bristles is the same on both brushes and brush head is 5cm across on both. Tarte Brush has a lighter wooden handle with a gold ferrule; IT brush is heavier with a rubberized plastic handle and a silver ferrule. The Tarte brush is slightly longer than the IT Cosmetics brush, but only by a few millimeters; both are approximately 14cm / 5.5" long. The bristles at the base of the Tarte brush seem slightly wrinkled or crimped. Tarte brush costs $32, IT Cosmetics brush costs $48. These brushes feel identical to me and they both seem to apply product the same way. I actually don't like applying foundation with these because the recommended circular buffing motion makes my foundation look uneven, but using a stippling/tapping motion instead irritates my skin too much, despite giving a nicer finish. It's also really difficult to wash all the foundation out of these brushes and it tends to stain the bristles. They're good for applying or dusting off excess powder, though, and they feel super plush and nice on my face. If I had to choose one over the other, I'd have to go with the Tarte Airbrush Finish brush at $32. The bristles are the same on both, but the black rubberized handle on the IT Cosmetics brush is a magnet for fingerprints and dust and is difficult to keep clean. 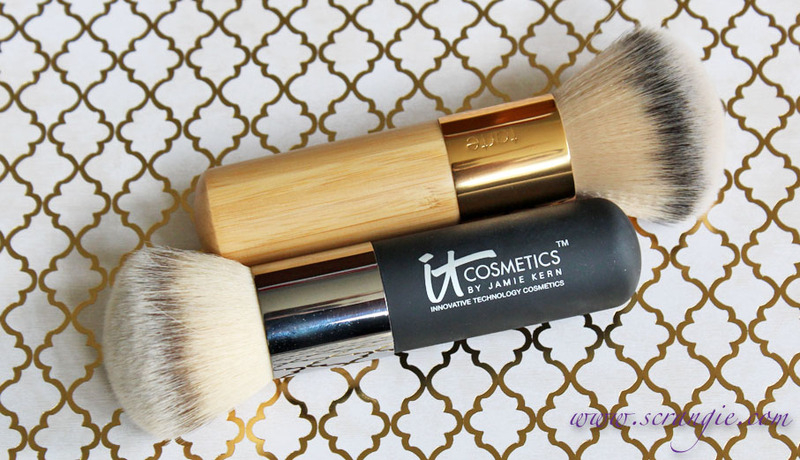 I do prefer the black and silver color of the IT Cosmetics Heavenly Luxe brush even if it is harder to keep clean, but looks aren't worth the $16 price difference between the two. it will be interesting to see how they both hold up over time! Definitely! I don't think I'll be using them for liquid foundation like they recommend, but I can see them lasting a very long time for use with powder only. it will be interesting to see how they both hold-up over time. Thanks for comparing these for us! 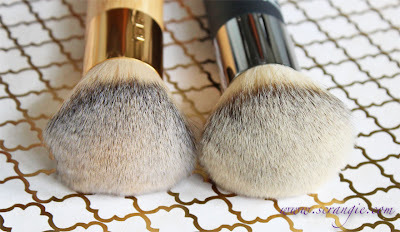 I seriously need to expand my brush collection, and I find posts like this really helpful! Wow! What a crazy comparison! They look exactly the same. When you mention applying foundation with the brush, are you talking liquid foundation or a mineral-type powder foundation? If you mean liquid, I wasn't aware you could do that with a brush! Oh, liquid! Sorry, I didn't think to specify but I should have. 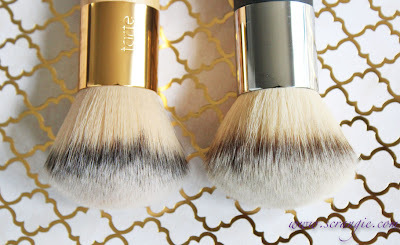 Tarte recommends using the brush to apply their Amazonian Clay foundation, but I think it looks terrible that way. The bristles clump together and make streaks, wiping off foundation in some areas and applying it in weird patches in others. Plus, it feels weird and hurts my face! @Scrangie - thanks for the comparison. I wa just about to buy the IT Cosmetics version, but will have to re-consider. Very informative, as always. @Scrangie - Thanks for the comparison. I was just about to buy the one from IT Cosmetics, but will have to re-consider. Very informative, as always. 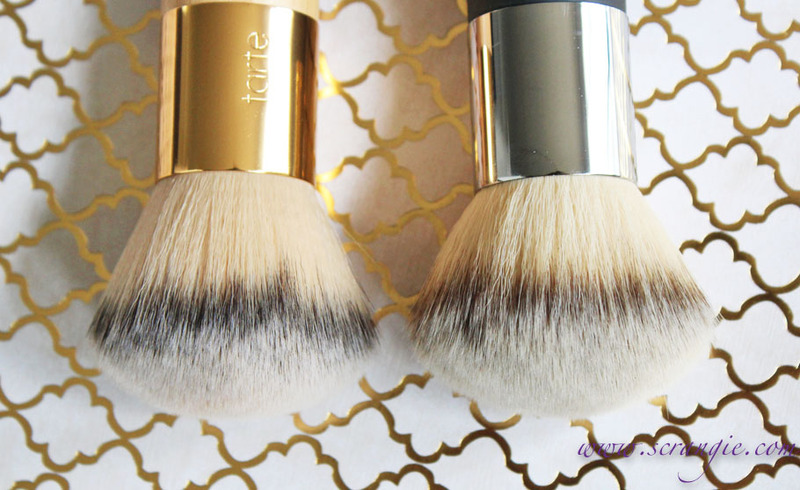 Really helpful comparison, I wish the tarte brush was easily available in the UK. Do they not present TARTE products on QVC-UK? I never looked at the QVC UK or now I think they have a QVC - Spain web site too. I need to look and see what's on those - however I bet they don't ship over to the US. Tarte I thought mailed over to the UK off their Web site. Not positive - have to look and see. I have the IT brush and like you said great for loose powder. 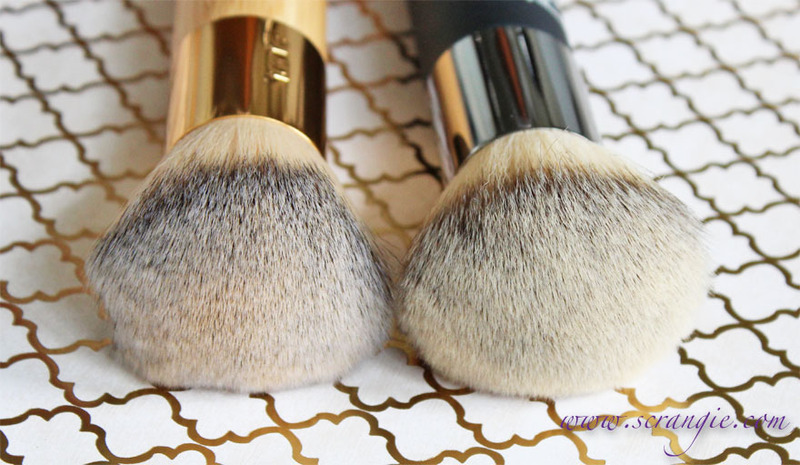 I think a good budget brush dupe for these may be the EcoTools bronzer brush. It's not as nice quality BUT still really great and I think the EcoTools bristles are softer and it is more dense plus the bottom of the handle is flat so it can stand up! 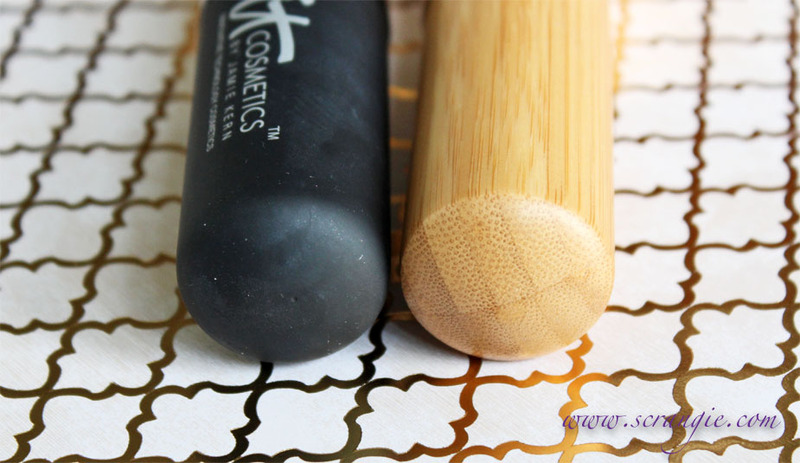 I always see those EcoTools brushes, maybe I need to get a few one of these days! Oh thanks so much for telling us this..Like Scrangie, I took have looked at those EcoTool brushes at my Rite Aide but not tried them as I figured they would be not anything to hold up because of being from the drug store...I will pick some up and give 'em a try. Ooooh those brushes look amazing! Great comparison post, Scrangie! I'm sure that you've helped many people decide which brush to get. Thank you :) That's what I was hoping for! have you ever tried Real Techniques brushes? I haven't- are they any good? I'll have to check them out! i love them! I only have a couple of them but i really love the expert face brush and the kabuki one (it folds out! lol) I can't compare it with other brushes really since the only other set I checked out were e.l.f. brushes, but it really cleans well. Thanks so much for this review. I have both these brushes. 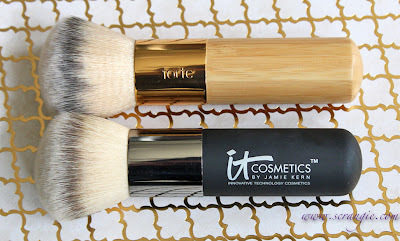 I also got the combo brush with Tarte full coverage Amazonian Clay foundation. The brush was too pretty for me to try to use it as they say to as I knew one use on foundation and that would be it probably for its use for powders. So I have always put on my Tarte foundation with my fingers - once used a sponge. I so wanted to try it with the brush because they really rave on air presentations on QVC (which is the only place to buy the foundation with the brush and FAR cheaper to buy it that way there than individual purchase). 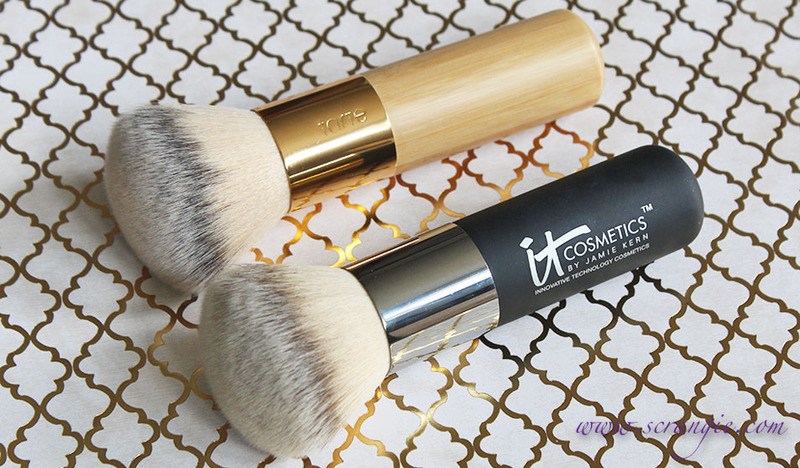 I got the IT brush with their finishing powder on a TSV with the IT concealer that also has it's own brush...and I got a 3rd brush from IT that is small enough to get up under the eye with the finishing powder. Really love all the IT brushes I have used (those 3 and 1 double ended for eye shadows). I have not been a fan of the brush for Tarts Amazonian clay 12 hr blush...love the blush not the brush on that one. IT has a hard to get loose blush that has a really good brush with it as well. I am with you that both brushes are made by the same 'group' of manufactures in China. 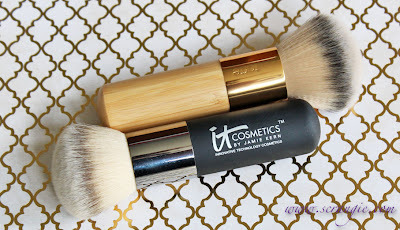 Thus far I have used my IT brushes a lot and they are holding up great...have not washed this big one yet however as only using it on a clear setting powder. Thinking it might be a challenge when I do need to wash it.